Aside from being nutritious foods, eggs also have benefits for our skin. Eggs can make the skin softer and moist. Amino acids contained in eggs is also believed to help pembantukan new skin cells. The results of the study said that the two main antioxidants lutein and zeaxanthin which eggs are known to increase more than four times the protection against adverse effects of UV. Diligent eat about one egg per day was significantly help increase the blood levels of lutein and zeaxanthin, but not cholesterol increase. Eating tomatoes can increase the content of collagen in the skin that can prevent sagging skin. 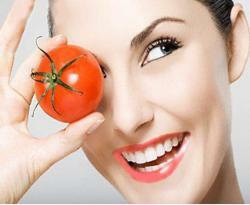 With the presence of antioxidants in it, the tomatoes can also be beneficial in reducing fine lines in the skin. Anyway, in addition to to tighten and brighten the skin, eating tomato sauce and juice can also help clear up acne. Strawberries are known as the fruit is rich in coenzyme Q10, which is a substance that helps fight against skin damage caused by free radicals and reduce the rate of aging. Alpha-hydroxyl acid content in strobey get rid of dead skin cells and help the body build collagen. Strawberries also contain vitamin C, an important antioxidant that helps prevent the appearance of spots, fight the aging process as well as the harmful effects of the sun. Citrus has been known since the first is a fruit that is rich in high antioxidant content. These substances can make the skin brighter. The content of vitamin C in citrus fruits could prevent conditions such as inflammation of the skin. Vitamin C is believed to enhance the absorption of vitamin E and iron in the body, thus making your skin will become more radiant. So, do not be surprised if the orange extract is widely used as a skin care products because of the benefits of 'magic' of fruit orange.